Car Tack in silver finish. Approximately 3/4 inch long. Comes with metal clutch back.Can be manufactured in any color minimum custom color is 60 pcs. Cowboy Hat Tac in gold and colored enamel. Approximately the size of a USA nickel. 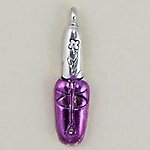 Nail Polish Bottle Charm in Silver or Gold finish.